For critically ill patients in a hospital's I.C.U., a portable chest radiograph is the most helpful, and most commonly used, x-ray examination. Cardiopulmonary complications and the malposition of lines, tubes, and catheters are often initially detected on a portable chest film. It is essential for hospital personnel to know how to approach and read these films, and yet little attention has been paid to teaching the accurate evaluation of this crucial diagnostic tool. The first book in more than a decade to specifically address this topic, I.C.U. Chest Radiology is an authoritative and concise guide to interpreting portable chest film; identifying and correcting any abnormal positions in the various devices inserted into the vascular and respiratory systems; and diagnosing abnormalities of the cardiopulmonary system. Radiology expert Dr. Harold Moskowitz outlines his approach and philosophy toward x-ray interpretation of the I.C.U. patient—one that can be used daily and in any I.C.U. setting. 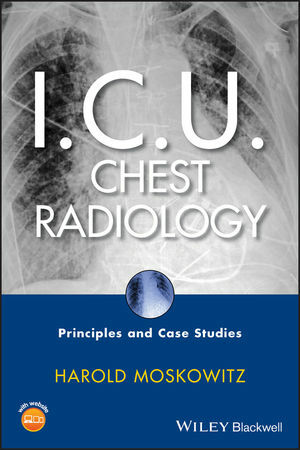 Divided into ten straightforward chapters, the book begins with a discussion of the physics necessary to obtain a proper film and moves on to the more clinical problems encountered each day in the I.C.U.—such as airspace disease, barotrauma, pneumonia, congestive failure, and malalignment of tubes and lines. Throughout, Moskowitz points out specific findings that can often make a difference in a patient's management. Supporting these detailed chapters is a CD featuring real-life case studies and radiographic images that simulate common problems in the I.C.U. This is a unique way for readers to prepare to handle the all-too-common scenario: the 2:00 a.m. call from an I.C.U. nurse that a patient has "crashed" and needs attention. Using knowledge gleaned from the chapters, the reader is encouraged to study the radiograph in each case, identify the various problems, determine the clinical condition that caused deterioration in the patient, and plan a course of action. Readers can test themselves with the cases and then listen as Moskowitz discusses the pertinent findings on the film. I.C.U. Chest Radiology is essential reading for those who work in or are associated with I.C.U.s—radiologists, intensivists, hospitalists, emergency room physicians, residents, medical students, physician assistants, respiratory therapists, and nurses. It will also be a valuable guide for personnel who work in step down units and emergency rooms. Dr. Moskowitz is Clinical Professor of Radiology and Director of Education in the Department of Radiology at the University of Connecticut Health Center. He is the Radiology Residency Program Director and Director of Graduate Medical Education at the Medical School, responsible for all student education originating in the department of radiology. Dr. Moskowitz's primary emphasis and interest is using radiology to teach various subjects such as anatomy, mechanisms of disease, principles of clinical medicine, and problem based learning. He also runs a very successful fourth year radiology elective that approximately three quarters of the fourth year students rotate through. He has been responsible for ICU radiology at the Health Center for eight years. Dr. Moskowitz has published over 35 articles in medical literature.